First-year Brian Lyle runs the bases in a previous game. On Saturday, April 21, the UChicago baseball team split a doubleheader against Benedictine, losing the first game in a close 3–2 match. However, the offense roared back in the second game and scored 12 runs, blanking the visiting Eagles. 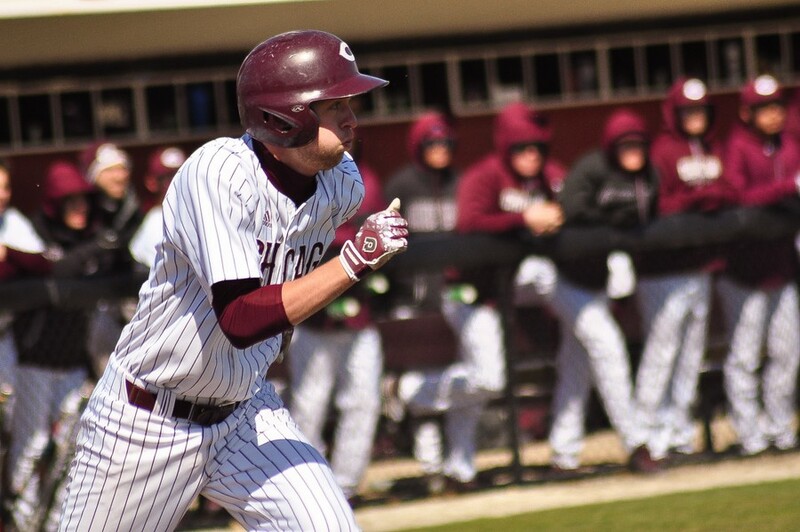 It was a case of déjà vu the day after, as the Maroons split another doubleheader at Elmhurst. Third-year pitcher Brenton Villasenor started the first game and put up a valiant effort, striking out 10 hitters and allowing only two earned runs, with an unearned third run coming in the top of the fifth inning. Second-year Drew Ventrelle and third-year Ian Bohn managed to bat in and score third-years Brady Sarkon and Connor Hickey in the second and third innings, respectively, but it was not enough to beat Benedictine. However, the South Siders’ fortunes turned around dramatically in the second game. Second-year starting pitcher Jacob Petersen had yet another stellar performance, allowing zero runs and only four hits in five innings of play, and second-year reliever Patrick Rogers continued this momentum in the last two innings, allowing no hits and striking out five hitters in one of his best performances this season. The offense began to awaken in the second inning, as Sarkon batted in a run to send third-year outfielder Josh Parks home. This strength continued throughout the game, coming to a head in the sixth inning. A fielding error by the Benedictine shortstop allowed fourth-year catcher Matt Slodzinski to score, and he was followed in quick succession by first-year second-baseman James Kelly, Ventrelle, first-year shortstop Brian Lyle, and Hickey. Parks topped off the inning with a solo homer. Sunday’s doubleheader had a very similar outcome. Despite strong performances from first-year pitchers Chandler Yu and Zach Morochnik, the Maroons still lost the first game 2–1. However, they rallied back to win the second game 3–1, leaving them with 18 wins and nine losses for the season. The first Saturday game was particularly special to the team, as it was a charity game for the Twin Hearts Autism Foundation to commemorate Autism Awareness Day, which was on April 2. In celebration, several children with autism were invited to the game along with their families, as special guests of the South Siders. The Maroons’ next game will take place at Rockford College on Wednesday, April 25, at 6 p.m.